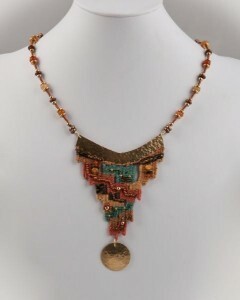 Thalia combines her weaving and textile skills with her beading, metal working and jewelry skills to create wonderful tapestry woven jewelry. She will be on hand in her studio # 8 during the January First Friday Art Walk, greeting visitors and explaining her techniques. As always the Art Center has art, artists and refreshments on all three floors. Live music by Daniel Sherrill. NEW! Take a ride with new Shuttle touring Art2Business locations during the Art Walk including the Ashland Art Center. Art2Business is a program where Businesses are matched with Art Work, making the businesses more inviting and giving artists a larger audience for their work. Find out more at www.ashlandartcenter.org/art2business.